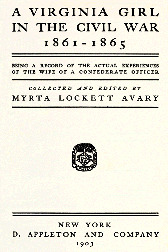 Myrta Lockett Avary, collected and edited by A Virginia Girl in the Civil War, 1861-1865. A Virginia Girl in the Civil War, 1861-1865. New York: D. Appleton and Company, 1903. Girls -- Virginia -- Biography. Virginia -- Social life and customs. Women -- Virginia -- Biography.